Mental health has historically been neglected as a factor in preventive health and overall health maintenance. Research demonstrates that mental health has a strong impact on individual and community economic success, even after accounting for physical health. 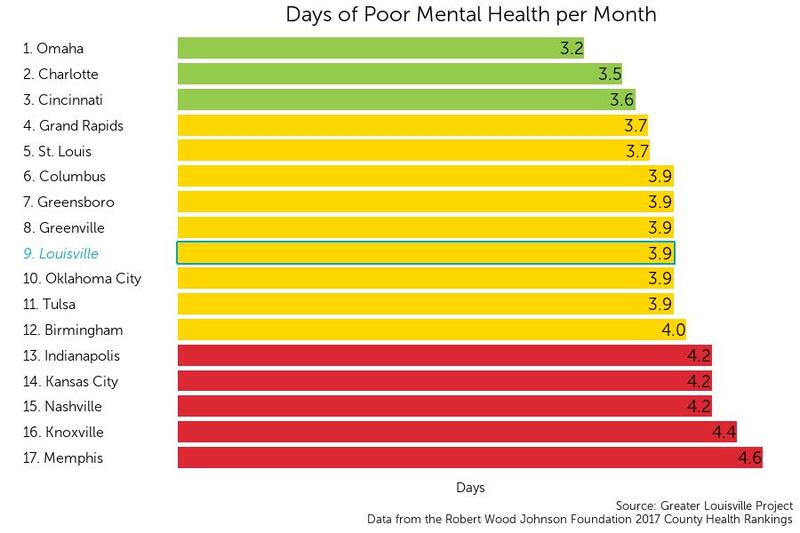 The poor mental health days measure is the average number of days in the past month that adults have reported experiencing less than good mental health. Louisville currently ranks 9th among its peer cities with an average of 3.9 days per month of poor physical health per month. Louisville ranks in the middle tier of its peer group according to a natural breaks algorithm. Cities in green are those that outperform their peers, cities in yellow represent the middle cluster, and those in red are a group that lags behind its peers on this indicator.